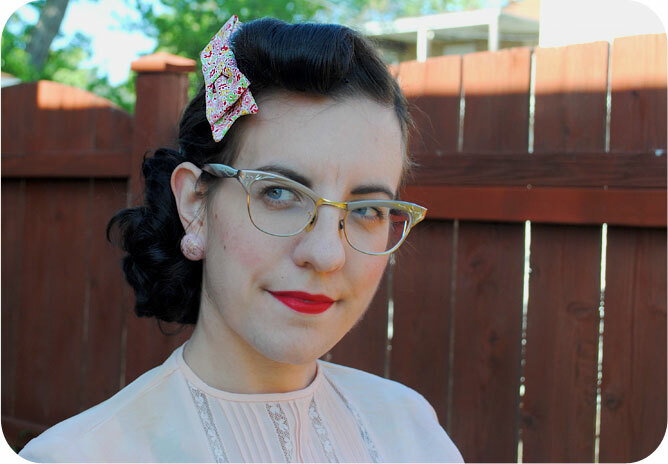 Today I’m sharing a tutorial I hope you’ll really enjoy: how to make a hair bow out of vintage feedsack fabric, with instructions to make your own pattern pieces, too. This is what I alluded to in my kickoff Made and Making post on Friday. By the way, thanks for all the positive comments on my new round-up series! 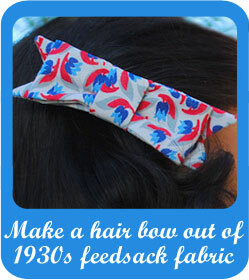 I hatched an idea born out of recent bad hair days: I wanted to create hair bows out of feedsack fabric. Feedsacks were the fabric bags used to hold grains, sugar, flour and such in the early part of the 20th century. 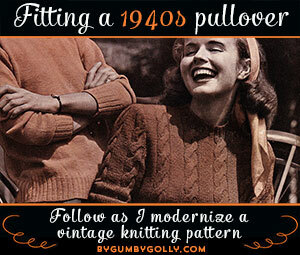 They were around earlier than that, but people often associate them with the 1930s, when they were most used and popular. 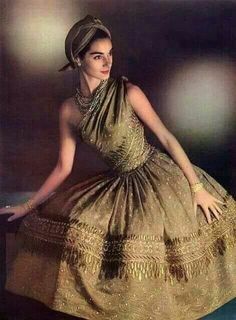 Women in rural areas would use the somewhat stiff, loosely-woven cotton fabric from the sacks their husbands brought home to the farm to make clothing and home accessories for their families. A wonderful example of recycling and making do! The patterns on feedsacks are out of this world. 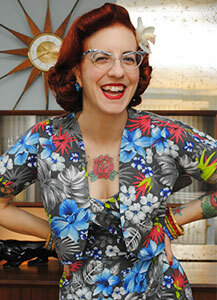 Often brightly-colored novelty prints and beautiful florals. 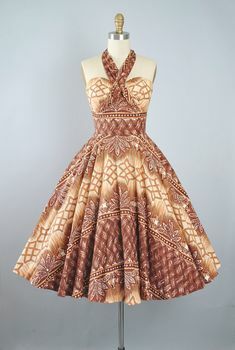 There’s just something about the prints and the fabric and the history that I adore! Want to learn more? Feedsacks: A Sustainable Fabric History is a great read. Now the problem with vintage feedsacks is that there’s just not that much fabric in a sack. 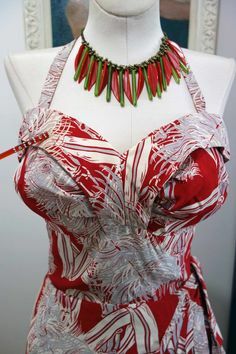 If you’re creative on how you use it or get lucky enough to collect multiples of the same print, you can use it for clothing. 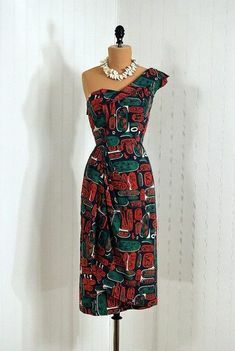 For example, Lauren of Wearing History made a fabulous 40s playsuit out of feedsack, and Kim Stewart (AKA Nudeedudee on Etsy) has oodles of amazing feedsack prints in her Flickr set and sews wonderful vintage fashions with it. But they can be hard to find, or expensive, or you might only find large scraps (possibly being sold to quilters as “fat quarters”). And if have an entire sack, you want to make the most of it! 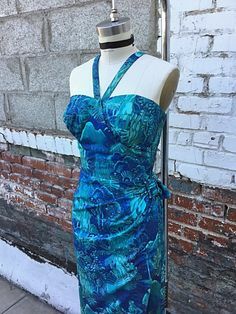 Even if you use the rest for clothing or quilting, you may have a bit leftover, and are looking for a project that uses just the weensiest amount of fabric. So I thought of a great way to use up feedsack scraps: make hair bows. I’m sure I’m not the first person to think of it… I bet some farmers’ wives back then fashioned feedsack hair bows for themselves or their daughters, too! There are oodles of bow tutorials online, but I wanted one that created a bow like a classic tied ribbon, with crisp cutout ends, so I came up with my own idea. I loved the results, and I whipped up this tutorial to share how I did it. The best part is these bows can be made with only 10″ x 9″ of fabric! 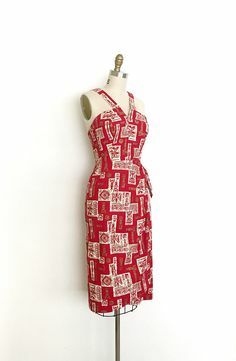 Perfect for a small partial feedsack, or any vintage fabric that’s precious to you, or just scraps to match an outfit you’ve sewn! Piece A — Fusible interfacing piece. This is the size of your finished bow. Everything else is based on this size. 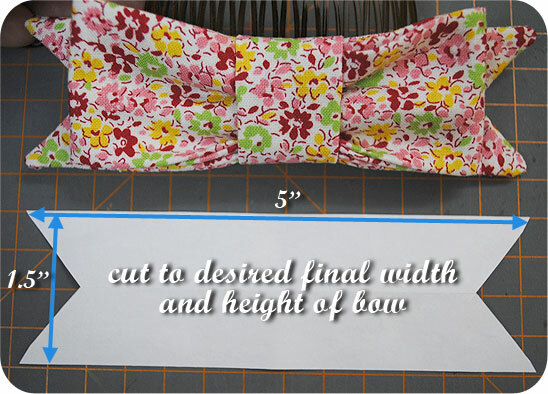 Piece B — The front and back of the cutout ribbon part of your bow. Piece C — The big looped part of your bow. Piece D —The smallest piece that wraps around the bow in the middle, giving it the distinctive bow shape. 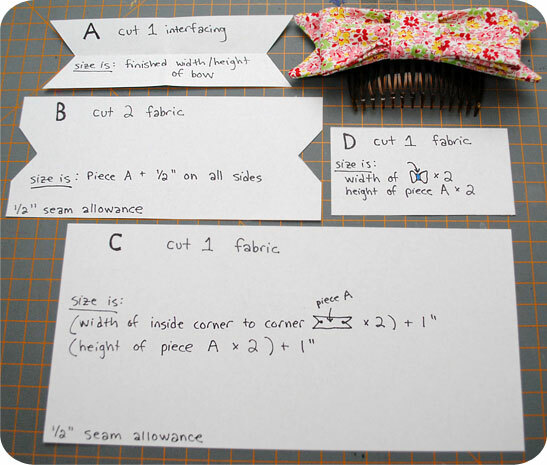 You’ll cut these 4 pattern pieces out of a sheet of paper. 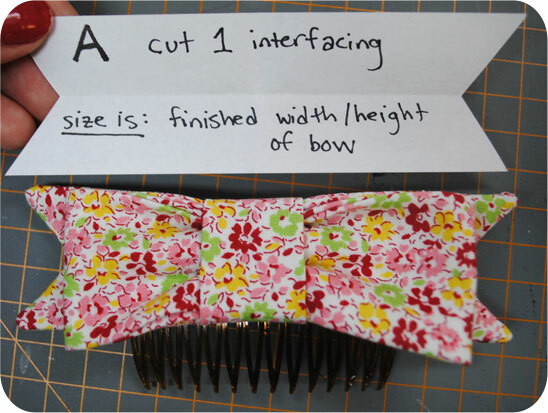 Because it’s fun to make bows in different sizes, I write on my pattern pieces how to measure for the size of that particular piece, so you’ll see my notes along the way. 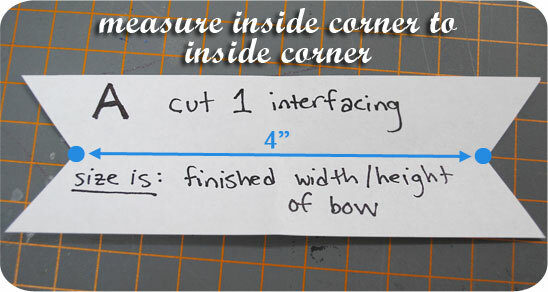 This makes it easier if you come back later and can’t recall how to re-size your pattern pieces for a new bow. 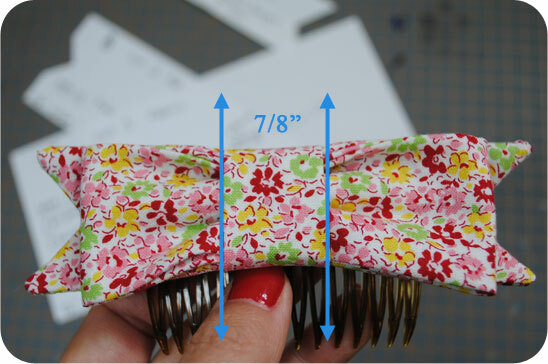 Decide how big you’d like your finished hair bow. After trial and error, I came up with 5″ wide by 1.5″ tall as a versatile size. For the sake of this tutorial, we’ll use these numbers throughout. So when I say you need a piece of feedsack at least 10″ x 9″, that’s for a finished bow of 5″ x 1.5″. 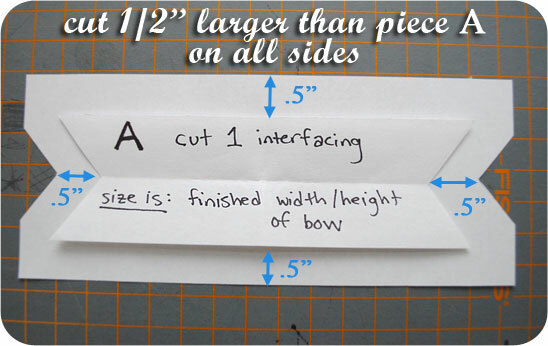 Cut out a piece of paper the size of your bow. In this case, 5″ x 1.5″. Not sure the best way to cut those inside corners so they’re perfectly the same on both ends? On one side, mark where you’d like the inside point. 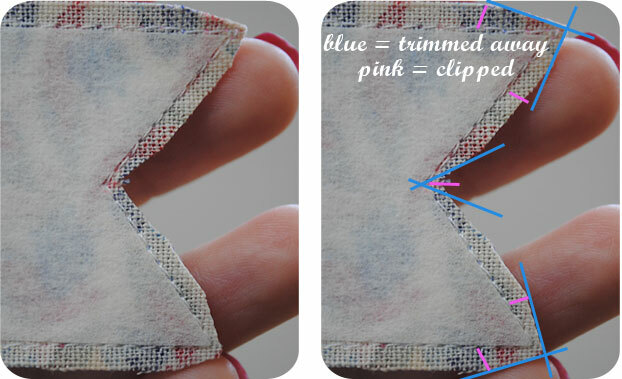 Fold your piece in half horizontally, then vertically, and snip off the ends together. Mark it Piece B. You will cut two of this piece in your feedsack fabric. 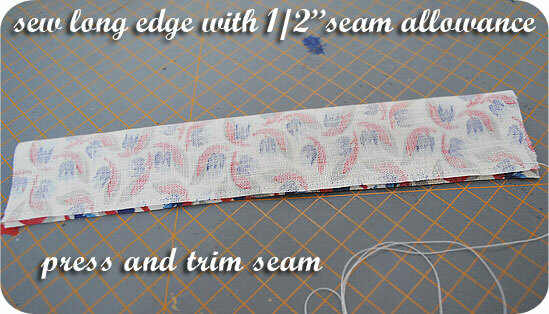 width: Twice the width of the inside corner to inside corner of Piece A plus 1″ for seam allowance. 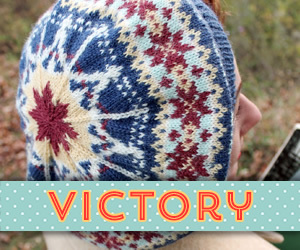 height: Twice the height of Piece A plus 1″ for seam allowance. How do you measure the inside corner to inside corner of Piece A? See below. 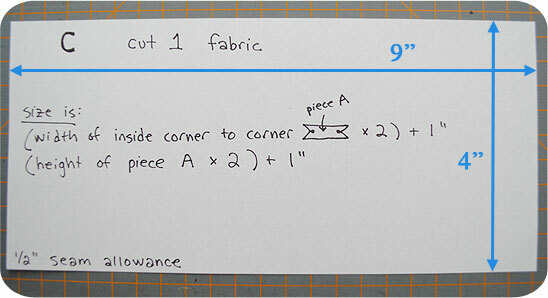 Mark it Piece C. You will cut one piece in your fabric. Piece D (last piece!) will be the little piece that wraps around the center of your bow. Decide how wide you want that to be. On mine, I liked 7/8″. 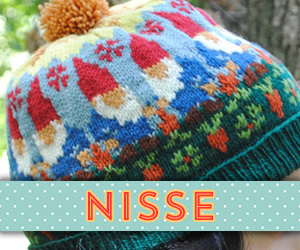 width: Twice the width you decide you’d like that piece to be. 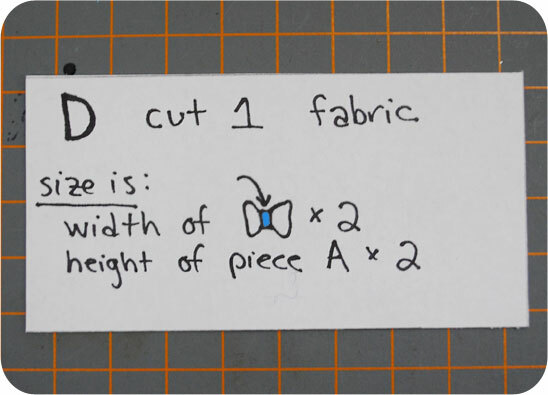 height: Twice the height of Piece A (no seam allowance needed). 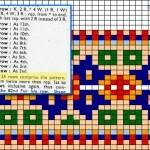 And you’re done with your pattern pieces! 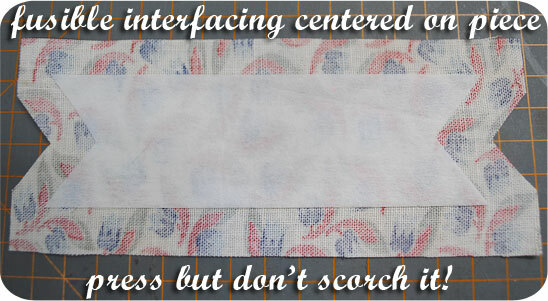 On one of your two Piece Bs, lay your fusible interfacing piece on it, centering it. 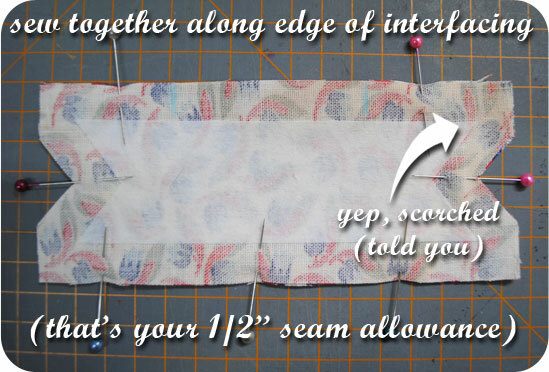 Make sure the gluey side of your interfacing is down. Press to fuse the pieces together. With right sides facing, pin together both of your Piece Bs. Mark about 2.5″ to leave open so you can turn your piece inside out. I used blue tailor’s chalk. 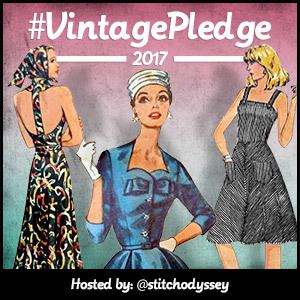 When sewing, with your needle in the down position, raise your presser foot at each corner and pivot the fabric to the next position. I’d recommend taking smaller stitches at the outside corners (the pointy bits), because it will help when you’re later finagling them into position. Tip! Leave one thread long at either the beginning or end of sewing these pieces together (remember, you leave a 2.5″ gap open to turn the piece right side out). 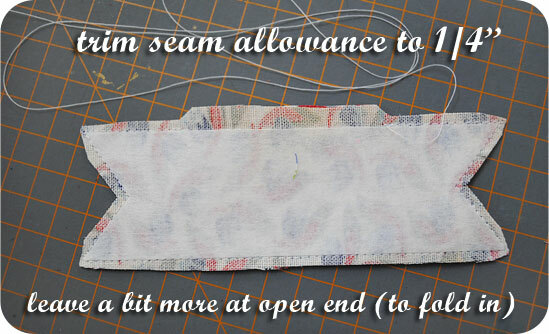 You can then use it to sew up the gap when you turn it right side out. 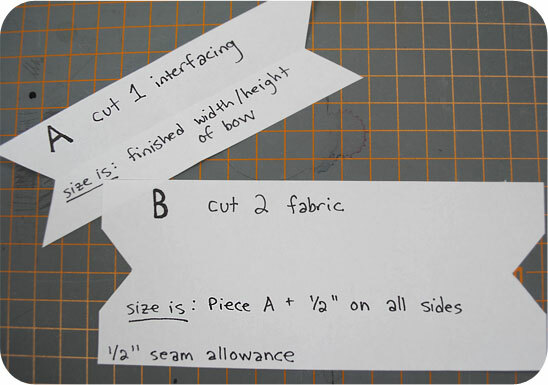 Press, and trim seam allowance to 1/4″. 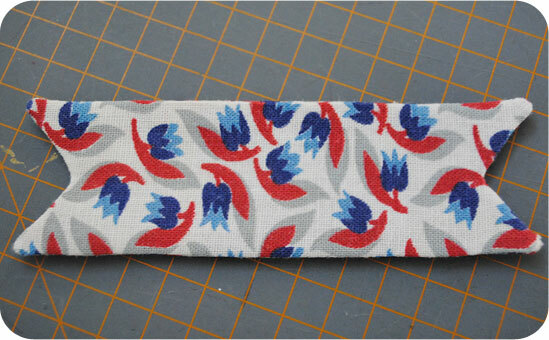 I like to keep a little extra on the open part because it’s hard to fold in a scant 1/4″ of feedsack! Turn right side out. To push the points into position, I first use my fingers from the inside to push as far as I can (not very far). Then I alternate between pushing with the blunt end of my seam ripper from the inside and pulling gently with the end of a pin from the outside. Be really careful with the pin so you don’t snag the fabric. Take your time, it’ll be worth it. 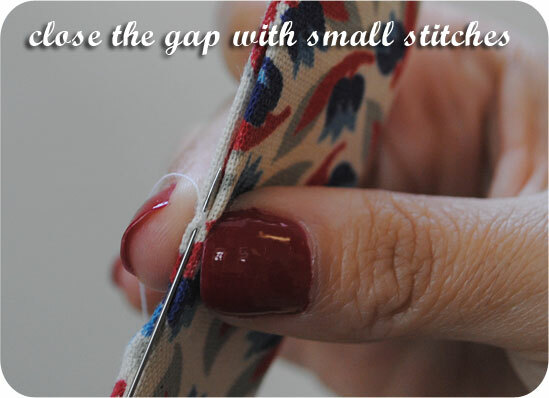 Fold in the extra bits of fabric at the gap, press, and slip stitch closed with small stitches. The most complicated piece is complete! Now for the easy stuff. 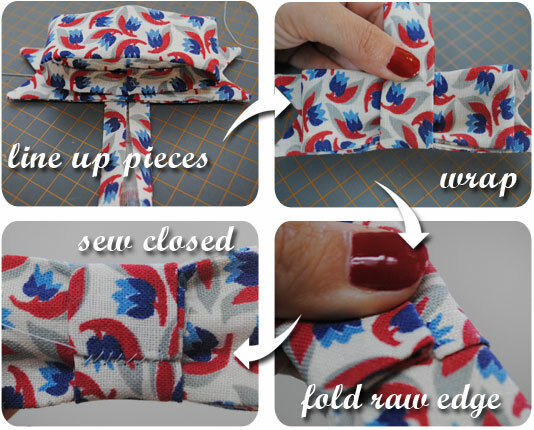 Fold piece C lengthwise in half and sew along the long open side using a 1/2″ seam allowance. Press and trim the seam. 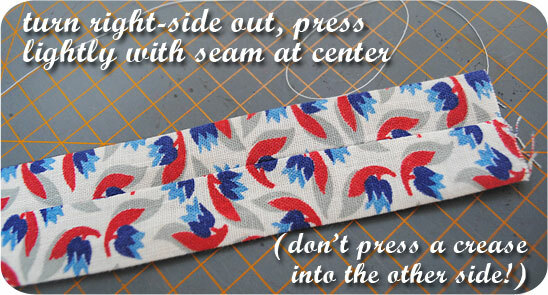 Turn the piece right side out and press lightly with the seam in the center. Don’t press too hard because you don’t want to press a crease into the other side—that’s the front. If you’re having a hard time, slip a metal ruler inside the tube and press that way. 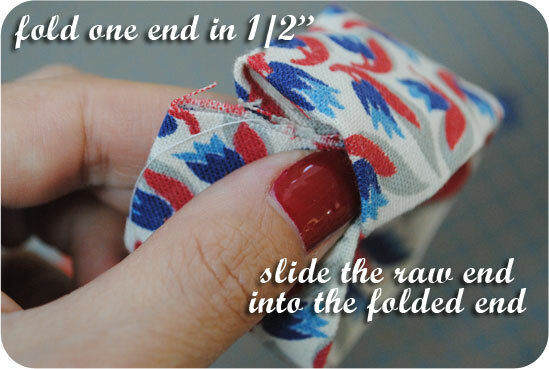 Fold one raw end in about 1/2″, and slide the other raw end into this end about 1/2″, forming a loop. 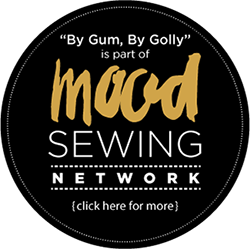 Before stitching it shut, you’ll want to eyeball it on top of your finished Piece B so you can decide exactly how you want to sew it shut. Done! 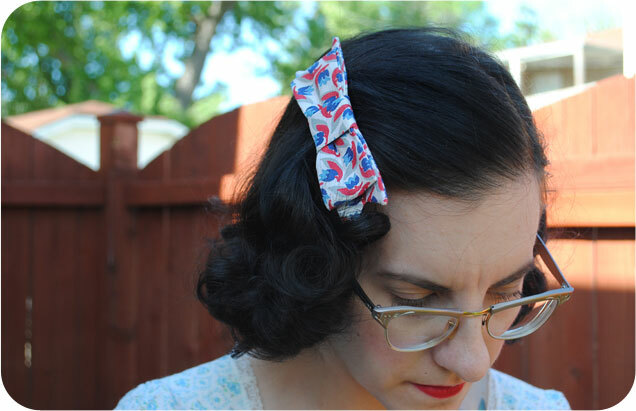 You now have your very own adorable hair bow out of a scrap of 1930s feedsack fabric. Go off and make a bunch more! 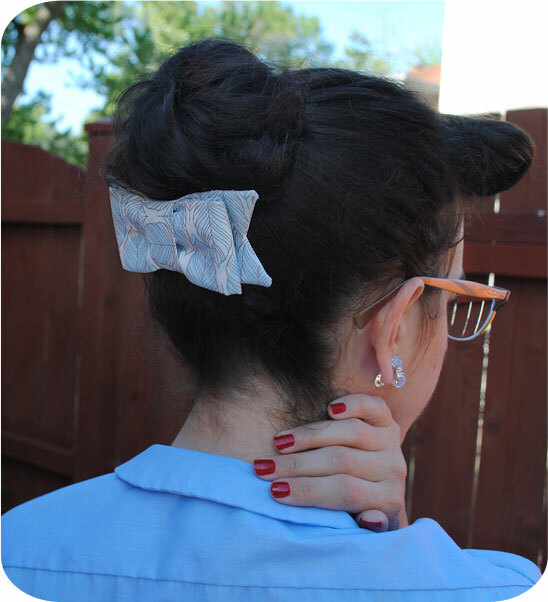 Or make a slightly larger one to adorn a bun or updo. 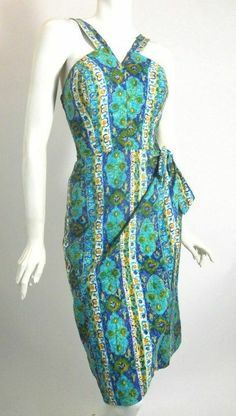 This one was made with scraps from my New York leaf dress last summer. Style it however you’d like. If you make one, please do let me know, I’d love to see it! Love it! 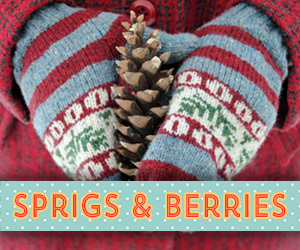 I’m always a fan of projects that use the leftover scraps. Er, that “Anonymous” was me. Not enough coffee in my Monday yet. Cute!! I love that it’s not an overly big/puffy bow (which, I mean, I like those too, but a time & a place for everything – I don’t always want to look like an giant toddler:) ). It looks really under under your bun, and also pulling up your ‘do. I may have to lurk around & see where I can source some combs like that locally. This is awesome. 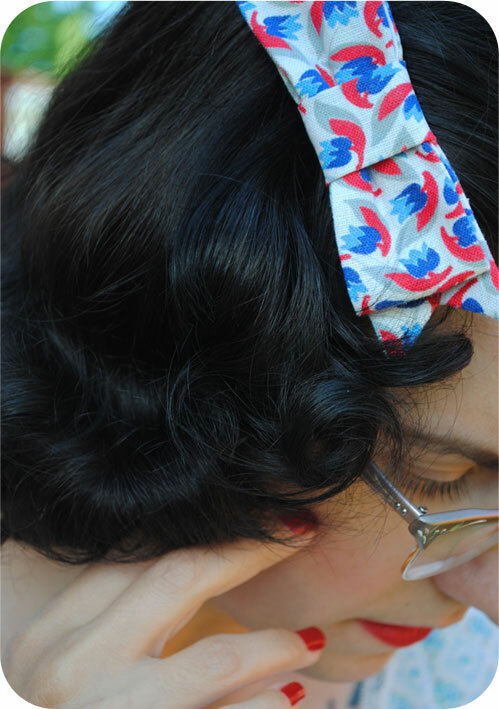 I have been super into matchy-matchy accessories lately…time to make a hairbow to go with Every Single Dress. I love this idea – thanks for sharing!! This looks like a fun weekend project to me! Thanks for sharing!!!! 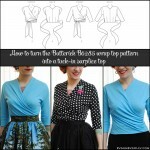 Fantastic tutorial- I have the perfect fabric in mind for this project!! 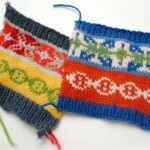 What an splendidly fun project with a beautiful accessory as the end result. I’m so in love with these darling hair bows that I’m half-tempted to give them a try by hand sewing (don’t have a machine). 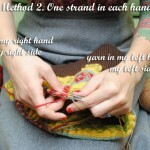 Amazing, thoroughly detailed tutorial, dear Tasha, thank you so much for posting!!! I love this! Especially the idea of putting it on a big clip. Thanks for taking the time to write such an indepth tute! 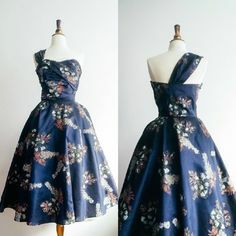 This would look good on a dress too. 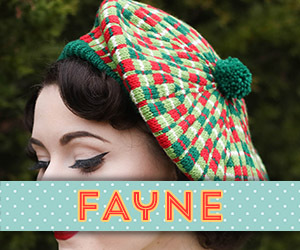 I’ve made bows attached to headbands, but I love the idea of stitching it to a comb instead! 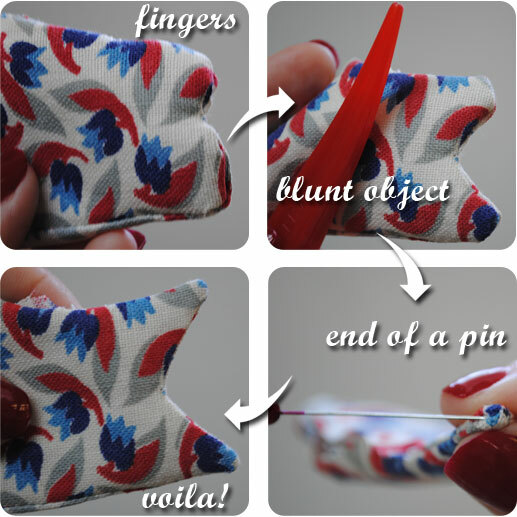 😀 Am going to have to make a couple for myself, I think… 😉 Thank you so much for sharing this how-to! These are so cute! I’m always trying to hot glue my fabric accessories to various clips which can be pretty tricky. 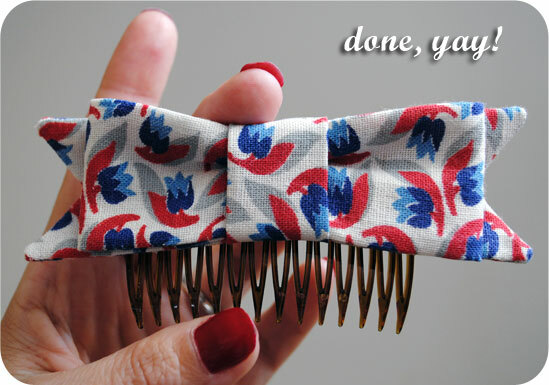 I like this idea of sewing the bow onto the comb instead. Thanks for sharing!